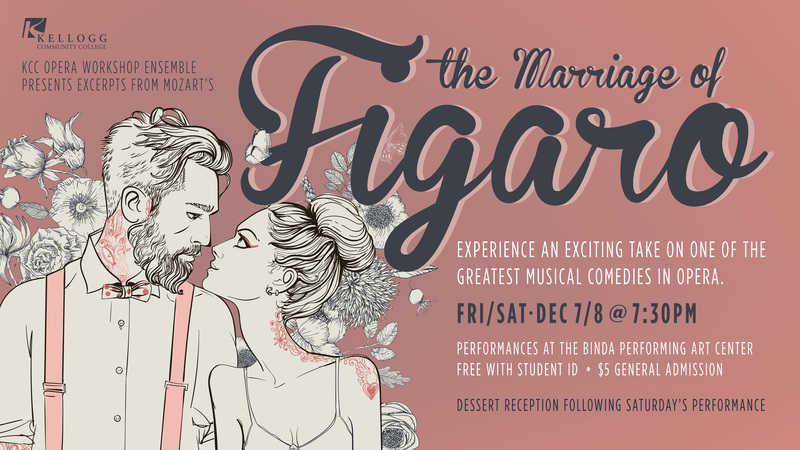 The Kellogg Community College Opera Workshop Ensemble will perform Acts One and Two of the comedic opera “The Marriage of Figaro” in English at 7:30 p.m. Friday, Dec. 7, and Saturday, Dec. 8. KCC will present the opera at the Binda Performing Arts Center on KCC’s campus at 450 North Ave. in Battle Creek. General admission tickets are $5 and can be purchased at the door; KCC students and kids 10 and younger are admitted for free. KCC Music Area Coordinator Dr. Gerald Case-Blanchard will direct the show. He said the themes of the opera, which was written in 1784, are still relevant today. “One among a wide number of issues addressed in this opera is class differences and privilege,” Case-Blanchard said. The story of love, marriage, suspicions of infidelity and jumping out of bedroom windows in the court of Count Almaviva, scored by Mozart, is one of the most performed operas of all time. It also draws in talent from all over KCC and the community. KCC’s Opera Workshop course (designated MUSI 297 in the course catalog) introduces all aspects of the art form to its participants, including acting, vocal technique, language and stage movement. Other areas of focus include audition techniques, scene study, musical collaboration and more. For more information about this or other KCC music initiatives, visit www.kellogg.edu/music or contact Case-Blanchard at blanchardg@kellogg.edu or 269-565-7859.